I made this for a few neighbors and it was a hit. 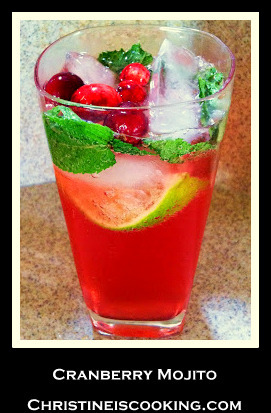 I will definitely be adding this Cranberry Mojito cocktail to my regular holiday repertoire. The measurements are approximate and can be changed to suit your tastes and the size of your pitcher. (1) Slice your limes into wedges and place them in your pitcher along with torn mint leaves and sugar. (2) Muddle (i.e. crush) the mint, lime and sugar together for a minute or so. (3) Add equal parts rum and cranberry juice. (4) Fill your pitcher about 3/4 of the way up with soda water and give the drink a taste test for sweetness and rum content. If the ratio is to your liking, fill the rest of the pitcher with ice and stir. Garnish the pitcher with fresh cranberries. Tip: If you don't have a muddler - you can use the end of a rolling pin or something similar.